A good year for torturers? By Prof Nicholas Hardwick, Professor of Criminal Justice (Royal Holloway, University of London) and collaborator of the Human Rights Implementation Centre (University of Bristol Law School). 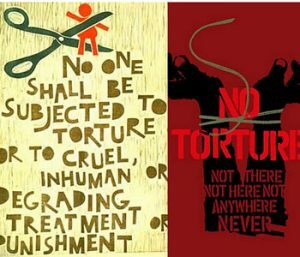 2017 looks set to be a good year for torturers. Most noteworthy, they have received a glowing endorsement from President Trump. When it was put to him in a recent ABC interview that during his election campaign he had said he would “bring back waterboarding…and a hell of a lot worse” he did not demur. “Would I feel strongly about waterboarding? As far as I am concerned we have to fight fire with fire,” he said. “Absolutely I feel it works”, he went on. Posted in Guest postTagged Association for the Prevention of Torture, Baha Mousa, ban on torture, CIA, Convention against Torture and Other Cruel, death rate, ECHR, European Convention on Human Rights, Human rights law, Inhuman or Degrading Treatment or Punishment, inhumane treatment, National Offender Management Service for England and Wales, Nicholas Hardwick, NPM Observatory, Optional Protocol to the Convention Against Torture, Phil Shiner, prohibition of torture, safety in prison, Sir Nigel Rodley, Sub-Committee on Prevention of Torture, think piece, torture, Trump, UN Human Rights Committee, UN Special Rapporteur on Torture, waterboardingLeave a Comment on A good year for torturers?